Heat oil in a large saucepan over medium heat. Add garlic and cook, stirring, until it just begins to color, 2 to 3 minutes. Add crushed tomatoes and saffron with soaking liquid. Bring to a simmer. Cook, stirring frequently, until thickened slightly, about 5 minutes. Strain the mussel broth through a fine-mesh sieve into the tomato sauce. Stir in the crushed red pepper and simmer over medium heat for 1 minute. Season with salt and pepper. Ladle about half the sauce over the pasta and toss to coat. 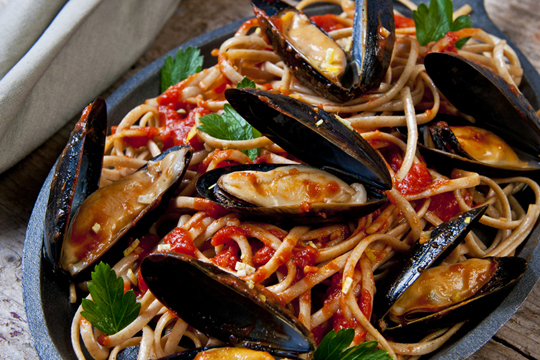 Divide the pasta among 4 pasta bowls, top with mussels and spoon the remaining sauce over the mussels. Serve topped with parsley and lemon zest.